Cynthia McCauley is a senior fellow at the Center for Creative Leadership in Greensboro, North Carolina. 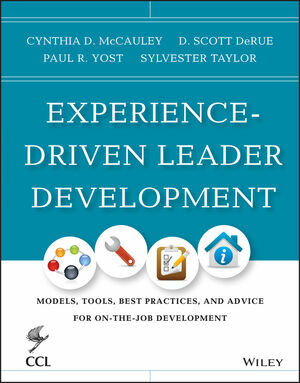 She is co-editor of The Center for Creative Leadership Handbook of Leadership Development and has been an active contributor for many years to the field of on-the-job leader development. Scott DeRue is a management professor and director of the leadership initiative at the Stephen M. Ross School of Business, University of Michigan. Reported by CNN/Money to be one of the top forty business school professors under the age of forty, DeRue conducts research and teaches in the areas of leadership and team development. Paul Yost is an associate professor of industrial-organizational psychology at Seattle Pacific University and principle and founder of Yost & Associates, Inc. He has worked at Microsoft, Boeing, GEICO, and Battelle Research in a variety of roles, including executive assessment, leadership development, and human resource research. Sylvester Taylor is a director in the Research, Innovation, and Product Development Group at the Center for Creative Leadership. He has more than twenty years of experience researching, designing, and implementing leadership development initiatives, primarily helping organizations gain value from organizational and multi-rater feedback.